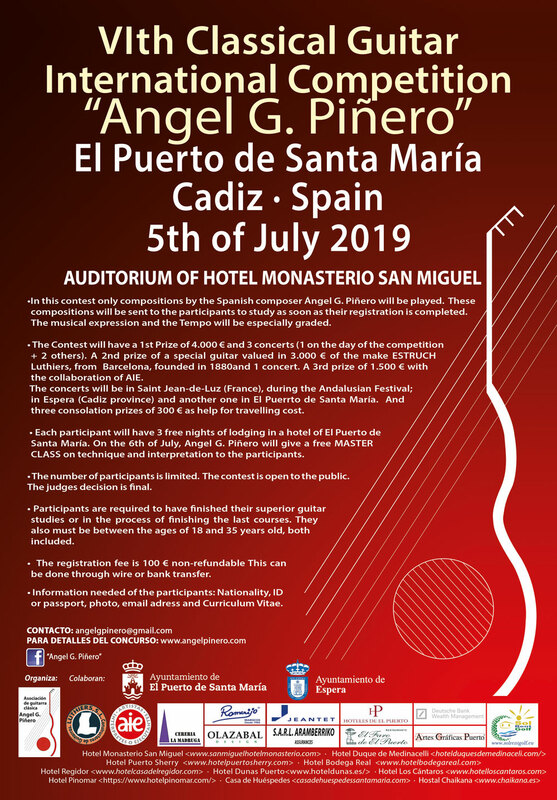 • In this contest only compositions by the Spanish composer Angel G. Piñero will be played. These compositions will be sent to the participants to study as soon as their registration is completed. The musical expression and the Tempo will be especially graded. • The Contest will have a 1st Prize of 4.000 € and 3 concerts (1 on the day of the competition + 2 others). A 2nd prize of a special guitar valued in 3.000 E. of the make ESTRUCH Luthiers, from Barcelona, founded in 1880and 1 concert. A 3rd prize of 1.500 E. with the collaboration of AIE. • The concerts will be in Saint Jean-de-Luz (France), during the Andalusian Festival; in Espera (Cadiz province) and another one in El Puerto de Santa Maria. And three consolation prizes of 300 € as help for travelling cost. • Each participant will have 3 free nights of lodging in a hotel of El Puerto de Santa Maria. On the 6th of July, Angel G. Piñero will give a free MASTER CLASS on technique and interpretation to the participants. • The number of participants is limited. The contest is open to the public. The judges decision is final. • Participants are required to have finished their superior guitar studies or in the process of finishing the last courses. They also must be between the ages of 18 and 35 years old, both included. • The registration fee of 100 € is non-refundable. You can send it through wire or bank transfer (the instructions are below. • Information needed of the participants: Nationality, ID or passport, photo, email address and Curriculum Vitae. Thanks and I am looking forward to seeing you in the Competition.